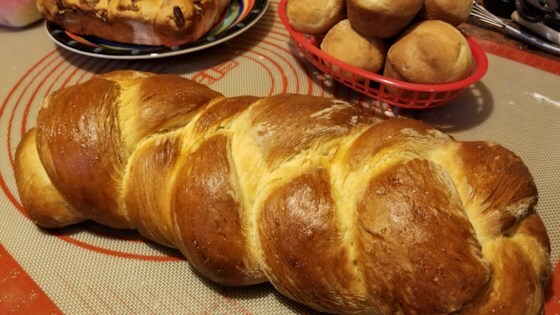 "A surprisingly sweet, yet light, challah that makes any night special. Feel free to knead some raisins into the dough if you like." In a small saucepan, combine water and margarine in a small saucepan. Heat until margarine is melted and very warm, but not boiling. In a large bowl, mix together 3 cups flour, white sugar, brown sugar, yeast and salt. Add water and margarine mixture; beat well. Add 4 eggs, one at a time, beating well after each addition. Stir in the remaining flour, 1/2 cup at a time, beating well after each addition. When the dough has pulled together, turn it out onto a lightly floured surface and knead until smooth and elastic, about 8 minutes. Deflate the dough and turn it out onto a lightly floured surface. Divide the dough into six equal pieces and form into long 'ropes'. Braid the pieces together to form two large loaves. Place the loaves on two lightly greased cookie sheets, cover the loaves with a damp cloth and let rise until doubled in volume, about 40 minutes. Brush the risen loaves with the beaten egg and sprinkle with poppy seeds. Bake in preheated oven for 45 minutes, until loaf sounds hollow when tapped. See how to make a light and airy challah.